These economically friendly, super value packs of 12 x 12 inch canvas are great for lighter paint applications, quick studies, practice and classroom or high volume use. The unbleached 4 oz. cotton is primed with acid-free acrylic titanium gesso to a finished weight of 8 oz. and stretched around and back-stapled to 5/8" deep, kiln-dried fir stretcher bars. Suitable for use with all acrylic paints, oil paints and other wet or dry media. The number of canvases per pack varies by size. Use these with kids, for adult painting classes, for your professional needs and for all other art, collage, décor, and home and craft projects. Great for kids and adults alike. Let your imagination run wild and paint for fun. These packs are a great value. Made by Art Alternatives. 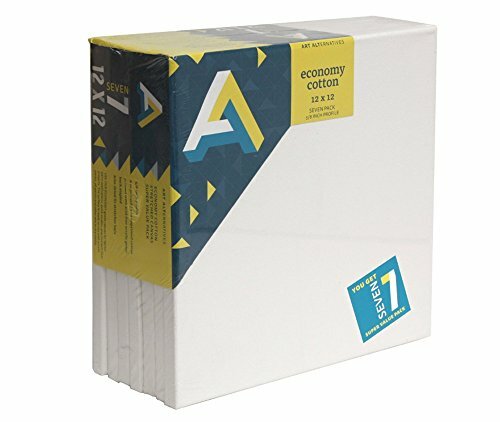 Art Alternatives Unbleached 4 oz cotton canvas for all media. Primed with acid-free gesso-ready to paint, collage, draw, sketch, illustrate. Back-stapled for a clean look-ready to hang and comes in standard size for easy framing. 12 inches x 12 inches- Pack of 7-for students, adults, and professionals.